Miami, FL – October 17, 2017 – The Global Wellness Summit (GWS) today announced winners of its prestigious Global Wellness Awards, which honor outstanding industry leaders in seven categories. Dr. Richard Carmona, M.D., the 17th Surgeon General of the United States and Chief of Health Innovation, Canyon Ranch, received the Summit’s first Leader in Social Impact award for his commitment to expand access to health and wellness to all people around the world. In a surprise announcement, Susie Ellis, Chairman and CEO of the Global Wellness Summit, introduced Jane Iredale, founder of Iredale Mineral Cosmetics, Ltd, who presented spa and wellness visionary Deborah Szekely with the first GWS Wellness Award for Living a Well Life. Szekely–who recently celebrated her 95th birthday–co-founded Rancho La Puerta in 1940 and the Golden Door in 1958. Recognized for embodying wellness principles and practices throughout her life, she received a standing ovation from delegates who gathered to honor her renowned contributions to the industry. Members of the GWS Advisory Board selected all winners and along with award sponsors presented honorees with their awards at the annual Summit held at The Breakers Palm Beach. The Social Impact Award, which honors a leader who has worked to make it possible for more people and societal groups to live healthier, happier lives, was presented to Dr. Richard Carmona by Dilip Barot, founder of Amrit Ocean Resort and Residences in Riviera Beach, Florida. Raised in Harlem, of Puerto Rican descent, Dr. Carmona is a nurse, physician, police officer, public health official, combat-decorated Vietnam veteran, and the 17th Surgeon General of the United States. He has used his position on the world stage to advocate for disease prevention, and for access to health services for the underserved. He is also a member of the board of the Global Wellness Institute, and is working to achieve the recently announced Wellness Moonshot and a world free of preventable disease. Szekely is recognized for her lifelong commitment to wellbeing and for inspiring others to learn from her example. The complete list of Global Wellness Award winners includes these wellness leaders who received their awards from the presenting sponsors, accompanied by members of the Global Wellness Summit Advisory Board. The award is presented to a global innovator from any wellness sector. Nygren created one of the first wellness communities in the world to protect the rural land just outside of Atlanta known as Chattahoochee Hill Country. GWS Advisory Board: Mary Tabacchi, PhD, RD, Professor Emerita, Cornell University, U.S. This award honors a leader or innovator in, or advocate for, sustainability in all its diverse forms. Jacobs has combined his creative vision of global hospitality and his passion for sustainability, impacting how people view their destination experiences. Presenting Sponsor: Miriam Senft, President & CEO, Motivity Partnerships, Inc., U.S. This award honors a woman who is making a contribution in any of the wellness sectors – whether as an entrepreneur or as a health and wellness champion. Through her organization, Wellness for Cancer, Bach works to bring wellness to those who have experienced or are living with cancer by connecting them with spa and wellness providers who seek to serve them. Presenting Sponsor: Josh McCarter, CEO, Booker Software, U.S. This award recognizes a leader in the field of workplace wellness and health promotion. Moorefield was honored for helping forward-thinking clients embed wellbeing strategies in the workplace and produce results that matter. Presenting Sponsor: Lauren Wright, President, Debra Simon Family Foundation & Daughter of Debra Simon, U.S. This award honors an individual who has achieved excellence in the field of mental health and wellness and has been a leader, advocate or innovator in wellness programs and pathways that help people thrive mentally. Schwartzberg’s inspiring films are used in hospitals and wellness centers to help people deal with stresses and anxieties, and he is a leading voice for emotional and mental wellness. Presenting Sponsor: Dilip Barot, Founder, Amrit Ocean Resort & Residences, U.S. The GWS is considered the world’s most prestigious gathering of leaders from every sector of the wellness industry: tourism, spa, education, beauty, fitness, nutrition, finance, environment, medicine, architecture, workplace wellness, wellness communities and technology. This year, a record 600-plus delegates from over 40 countries participated in the three-day Summit. 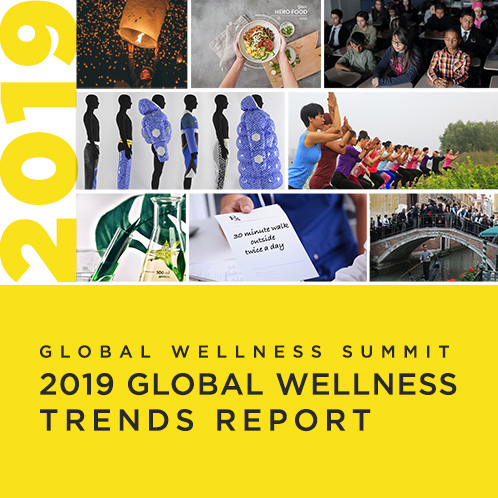 About the Global Wellness Summit: The Global Wellness Summit (GWS) is an invitation-only international gathering that brings together leaders and visionaries to positively shape the future of the $3.74 trillion global wellness economy. Held in a different location each year, the Summit attracts delegates from all over the world. Summits have taken place in the U.S., Switzerland, Turkey, Bali, India, Morocco, Mexico City, and Austria. The 2017 Global Wellness Summit was held at The Breakers Palm Beach, October 9-11. The 2018 Summit will be held October 6-8 at Technogym Village, Cesena, Italy.